HANOVER, NH - The first national study to look at the connection between smoking in movies and smoking initiation among adolescents shows that exposure to smoking in popular films is a primary risk factor in determining whether young people will start smoking. The study by researchers from Dartmouth Medical School (DMS) and Norris Cotton Cancer Center (NCCC) appears in the November 7 issues of the journal, Pediatrics. The research, supported by the National Cancer Institute, suggests that exposure to movie smoking accounts for smoking initiation among over one-third of U.S. adolescents. It concludes that limiting exposure of young adolescents to movie smoking could have important public health implications. "We found that as the amount of exposure to smoking in movies increased, the rate of smoking also increased," said lead author Dr. James Sargent, professor of pediatrics at DMS and director of the Cancer Control Research Program at NCCC. "Part of the reason that exposure to movie smoking has such a considerable impact on adolescent smoking is because it is a very strong social influence on kids ages 10-14," he said. "Because movie exposure to smoking is so pervasive, its impact on this age group outweighs whether peers or parents smoke or whether the child is involved other activities, like sports." In the study, 6,522 U.S. adolescents aged 10-14 were asked to identify films they had seen from a list of 50 randomly selected titles out of a database of films released in the U.S. from 1998 - 2000. Researchers found examples of movie smoking in 74 percent of the 532 movies in the database. Based on the movies each participant had seen and the amount of smoking in each movie, the adolescents were split into four levels of exposure to movie smoking. Researchers then examined risk for adolescent smoking, comparing adolescents in the higher movie smoking categories with the lowest category and controlling factors known to be linked with adolescent smoking, like peer and parent smoking. Even after considering all other factors known to influence the smoking risk, DMS researchers found that adolescents with the highest exposure to movie smoking were 2.6 times more likely to take up smoking compared to those with the lowest exposure. All else being equal, the researchers found that of 100 adolescents that tried smoking, 38 did so because of their exposure to smoking in movies. The study confirms the results of a regionalized study by the researchers that focused on adolescents in Northern New England, published December 15 in the British Medical Journal. The data in that research showed that exposure to smoking in movies had a similar impact on first-time cigarette smoking, but the children interviewed for that study were predominantly Caucasians living in mostly rural areas, and so the results could not be applied to the rest of the country. "The finding on minorities is concerning," said co-author of the study, Dr. Linda Titus-Ernstoff, professor of community and family medicine at DMS. "On average, Hispanic and black adolescents are exposed to more movie smoking than whites, so movie smoking may have a greater impact in these populations." The team also hopes that, in light of their new research, the movie industry will be persuaded to voluntarily reduce depictions of smoking and cigarette brands. They also suggest that the movie industry could incorporate smoking into the movie rating system to make parents aware of the risks a movie with smoking poses to the adolescent viewer, and include an antismoking preview on all DVD movies that depict smoking. "Those measures would have a minimal cost to the movie industry," said Sargent. Co-authors of the study, in addition to Sargent and Titus-Ernstoff, are Madeline Dalton, PhD; Michael Beach, MD, PhD; Jennifer Gibson, MA; Anna Adachi-Mejia, PhD; Charles Carusi, PhD; Susan Swain, PhD; and Todd Heatherton, PhD. Dr. Beach is a member of the Department of Anesthesiology at DHMC and a professor of anesthesiology at DMS, as well as a member of NCCC. Drs. Dalton, Titus-Ernstoff, Adachi-Mejia, and Gibson are members of NCCC. 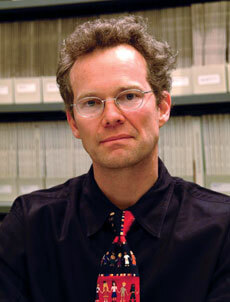 Dr. Heatherton is a member of the Department of Psychological and Brain Sciences at Dartmouth College. Sargent is one of the lead scientists in a prolific research group at Dartmouth dedicated to understanding adolescent behavior and how it's linked to exposure to movies. They have published numerous studies. In January 2001, this research team reported that actor endorsement of cigarette brands in movies was increasing. In March 2001, they released findings that adolescents whose favorite movie stars smoke on-screen are more likely to be smokers themselves. In December 2001, they published a paper stating that children are less likely to smoke if their parents disapprove. A paper in February 2002 stated that children who are not restricted from watching R-rated movies are three times more likely to smoke or drink alcohol compared to those who are never allowed to watch them. 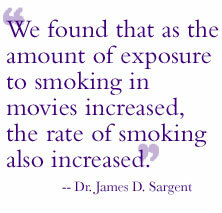 In 2003, the group released a recommendation to pediatricians to tell parents that limiting access to movies can reduce their chance of smoking. In May of 2005, the group published a study that found that tobacco brands are still common in PG-13 movies despite the 1998 Master Settlement Agreement the prohibits tobacco companies from paying for tobacco brand appearances in movies, and in September 2005, the team determined that preschoolers ages 2-6 use cigarettes and alcohol while role playing as adults, signaling that tobacco and alcohol education should start at an early age.